UNITED NATIONS, February 9 -- Thursday's Security Council debate on the Organization for Security and Co-operation in Europe was as interesting, if it was, for who was not there as for who was. 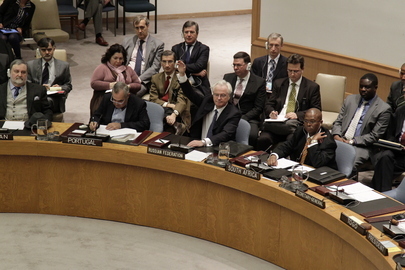 Of the Council's Permanent Five members, Vitaly Churkin of Russia was the only Permanent Representative present. He said that "some frozen conflicts" are no longer frozen -- i.e. Abkhazia and South Ossetia. But where were the other Permanent Representatives? One whispered to Inner City Press: "Syria." Even though the Council debate was on OSCE - the E is for Europe - Syria was brought up, by Portugal and then by Eamon Gilmore, the OSCE chairman, taking off that hat and speaking and Ireland's foreign minister. Inner City Press waited afterward to ask him about Lithuania's block on Serbia as chair in 2014, but he'd headed straight to meet with Ban Ki-moon. Ban's hastily announced idea of a joint UN - Arab League envoy and/or mission to Syria was not kindly reviewed. In one major country's mission to the UN, Ban's stakeout was watched on UN TV amid groans. "God, he's terrible," a diplomat there said, suggesting a "social media compaign" using the hashtag #FireBan. You heard it here first. Still the OSCE debate had its moments, for example when Azerbaijan got to talk about Nagorno Karabakh. Only the 15 Council members could speak, so Moldova was not heard from for example, nor Kygyzstan which US deputy Rosemary DiCarlo brought up. The action, as they say, was elsewhere. And it concerned Syria. Watch this site.